Buffet Dinner : From 17.30 to 18:30 hrs. 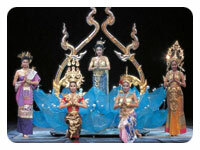 ALANGKARN's vision is aimed to provide entertainment to clienteles by showing the unique concept of being "Thai" to foreigners. Instead of presenting a traditional Thai performance where easily found anywhere, a new concept was applied by using a modern style of dance combined with multi-dimension colored laser, lighting and real surround sound system. 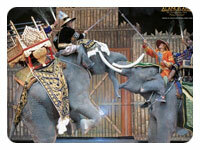 ALANGKARN is located on Sukhumvit road 155 KMs, Jomtien, Pattaya with an area of 80 rais. The entire project includes Theatre, Cultural Rostrum and Restaurant. 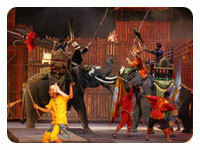 At the heart of ALANGKARN is the "Theatre", a state-of- the-art theatre that seats 2,000 pax. Decorated in Thai-Modern Style with a 70 meters length Hexa stage, big sized 11 x 15 meters movie screen, water track 30 meters for presenting "Modern Thai Multi-Dimension Show" with combination of multi-dimension technique presentation, such as pyrotechnic, multi-color laser show, real surround system and more. All synchronized to be a modern Thai Multi-Dimension Extravaganza show called "ALANGKARN"
You can indulge in a sumptuous feat of Thai and International buffet in Thai-Modern Restaurant with capacity of 1,000 seats. A Fantastic Shape with Thai handicraft demonstration and ideal for shopping with a wide range of high quality souvenir products of more than 1,000 items.